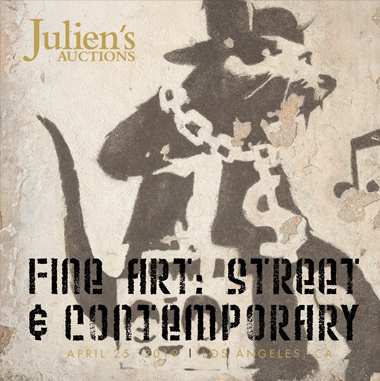 On Thursday, April 25, 2019, Julien’s Auctions will be hosting the spring edition of their triannual Street and Contemporary Art Auction in Beverly Hills. The exhibition and auction will feature an array of works by some of the most eminent artists of today including Banksy, Invader, Mr. Brainwash, KAWS, Damien Hirst, Shepard Fairey, Sandra Chevrier, Takashi Murakami, Ai Weiwei, David Hockney, Alec Monopoly, RETNA, D*Face, FAILE, Max Zorn, and more. Among the highly anticipated works being offered is Banksy’s Hayne Street Ghetto Rat (estimate: $60,000-80,000) an original aerosol stencil on concrete executed circa 2004 on the façade of a Hayne Street building near the world famous Smithfield Meat Market in London, and Invader’s SD_10 (aka The Mothership) (estimate: $60,000-80,000) a monumental tile mosaic created in the summer of 2010 on the Art Center Building in San Diego as part of an exhibition organized by the Museum of Contemporary Art (SD). The building is currently being remodeled and the mural must be sold in order to protect it from demolition. The auction will also spotlight Mr. Brainwash’s Madonna an original acrylic work on canvas featuring the same base image of Madonna, created by Brainwash for the cover of the pop icon’s Celebration album (estimate: $10,000-15,000); Pablo Picasso’s master work Wood-Owl, a painted earthenware vase from a limited edition of 500 (estimate: $20,000-30,000); Damien Hirst’s I Love You, a large screenprint from a limited edition of only 14 (estimate: $10,000-15,000); Shepard Fairey’s Obey with Caution, a unique artist’s proof HPM on wood (estimate: $8,000-10,000); Banksy’s Blowpop Records, an aerosol stencil on record sleeve (estimate: $8,000-10,000); and the Ron English work on canvas Cowgirl, (estimate: $8,000-10,000). Registration is required to bid in this live auction and can be done in person at the exhibition and auction, or online before the sale at the JuliensAuctions.com Registration page to bid by phone, proxy or in person, or online at JuliensLive.com/signup/ to bid live online, or by calling (310) 836-1818. 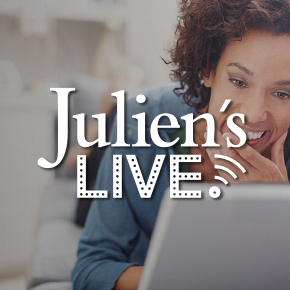 Bid through Julien's Auctions Online Live in Real Time at JuliensLive.com. Bid over the telephone through an auction house representative. Submit a bid in person. Enter Absentee bids. Absentee bid forms are printed in the back of each catalogue, and are also available by calling Julien's Auctions or online www.juliensauctions.com.